Below are a list of Boating tips that hopefully will be helpful to you. Contact us for any questions you may have. We are here to help. Don't be left stranded on the side of the road. Lately we have been seeing quite a lot of wheel bearing failures; this is a direct result of lack of maintenance. Wheel bearings on boat trailers go through hell. They get driven down the road, heating up along the way. Then once at the boat ramp those heated up bearings are dunked into the water (usually salt water) where they are instantly cooled down sizzling away the grease on the bearings that is used to lubricate them. This action over a short period of time deteriorates the grease leaving the bearings with no lubrication & open to moisture. Once this occurs, the bearings will then start to rust, fail then leave you stranded. It is certainly not any fun being stuck on the side of the road with collapsed wheel bearings. All this can be avoided with annual trailer maintenance. Highly recommended. 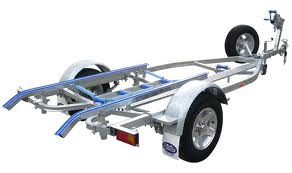 Inquire with us today to have your trailer checked. All marine engines rely on a water pump to keep it cool. Lack of maintenance of these can cause disaster for the engine. Water pumps use a rubber impeller inside the water pump that wear out & deteriorate over time. Whether the engine is used frequently or not, these impellers should be replaced every year as lack of use dries out the impeller & causes it to crack & fail. Inquire with us today to have your water pump checked.